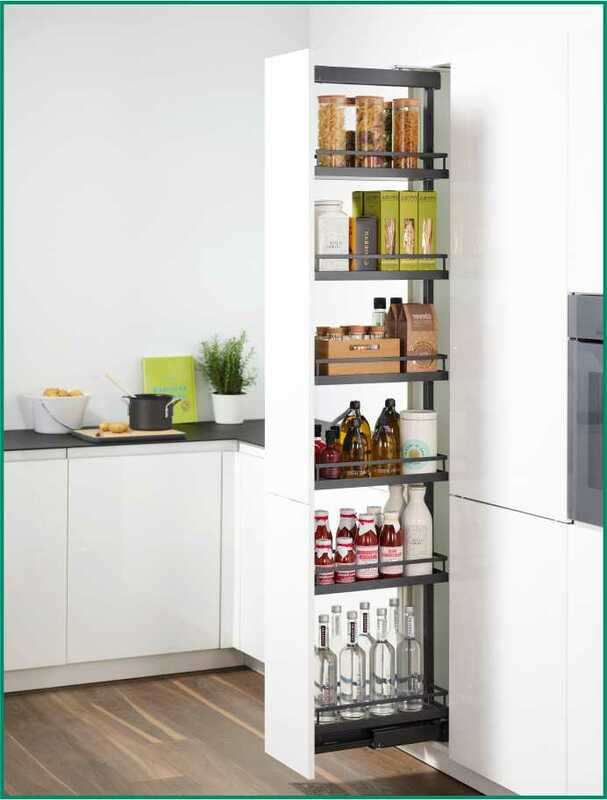 Tall units from Kessebohmer, are attractive mechanisms in a variety of applications to make clever storage possible in the kitchen. The ideals of clever storage are that stored food can be seen at a glance, not hidden in the dark recesses of a cabinet or shelf. 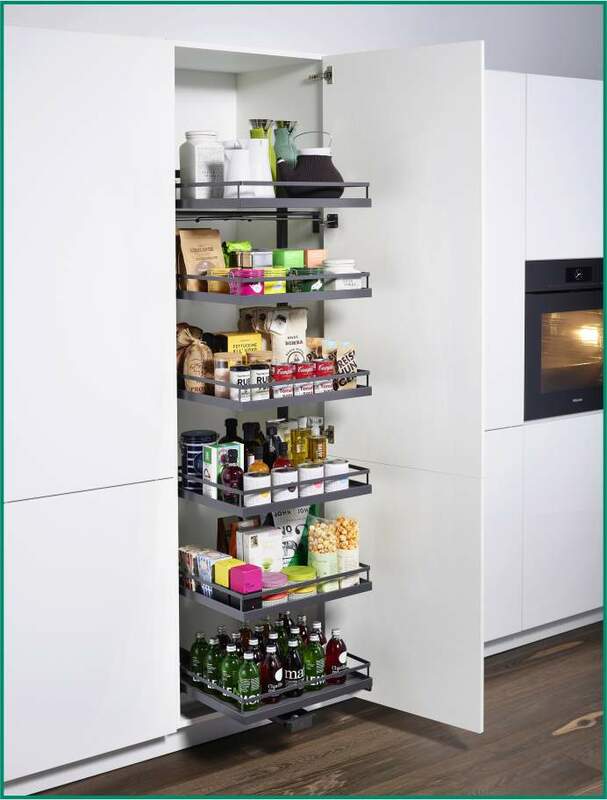 Tall units from Kessebohmer, glide effortlessly at the lightest pull, and in the case of touch control with a light knock on the cabinet front, to provide full access to stored goods. Baskets and mechanisms are manufactured in such a way as to provide the maximum available space to stored goods which is far above the industry standard. New highboard at an entry level price for Kesseböhmer brand quality. TANDEM solo offers a simplified solution with the characteristic opening experience of all Kesseböhmer fittings where all elements are linked in a smooth flowing movement. Opening the door draws the fitting forward with all the contents; the door opens on hinges with 110° opening angle. The closing damping is integrated in the hinges. Up to six trays can be clipped onto the frame at freely chosen heights. The support profile is mounted high up on the carcase sides, but its position is not dictated by the clear inside height of the carcase. The advantage is that the manufacturer needs only a limited range of frame heights to cover a range of different carcase heights without modifying the fitting. The fitting can be installed right or left, which also helps to simplify logistics. Tandem - a swivel pull-out for larder units - offers new potential for food storage - just opening the door is an inspiration. In a clever piece of engineering, the back shelf element moves automatically towards the user as the door is pulled open. Kitchen user can view contents at a glance and easily reach what they need. The shelf element on the door is designed to make best use of the available space. 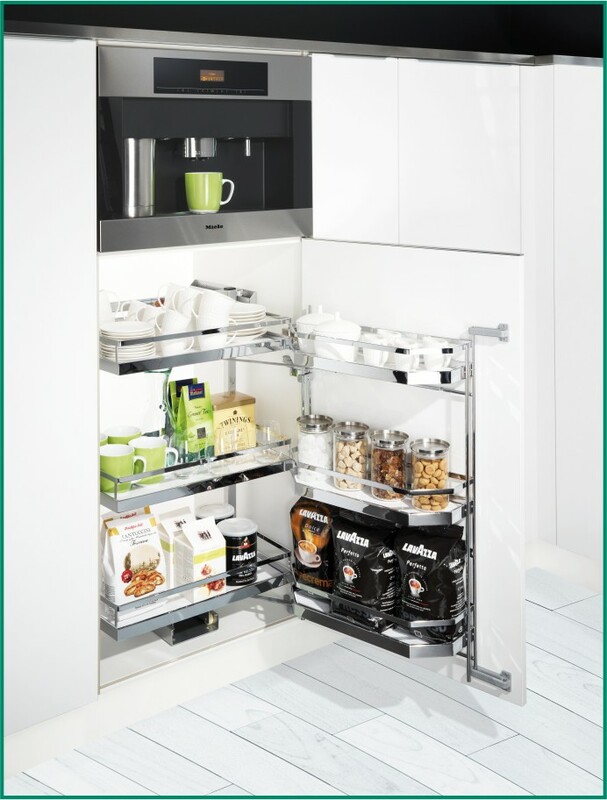 In tall units housing a coffee machine, steamer, oven or microwave oven integrated at an ergonomic height, a Coffee Tandem unit fitted underneath is the ideal pairing. By splitting up the storage space, it makes for clearer organisation and fast access. Underneath a coffee machine, for example, one could store mugs, coffee, sugar - all in clear view and easy reach. It’s the ideal system for themed kitchen units. Perfect Storage sums up this popular solution. The trays and baskets can be individually hung at heights to suit the contents. The Dispensa larder pull out, is a versatile space miracle. 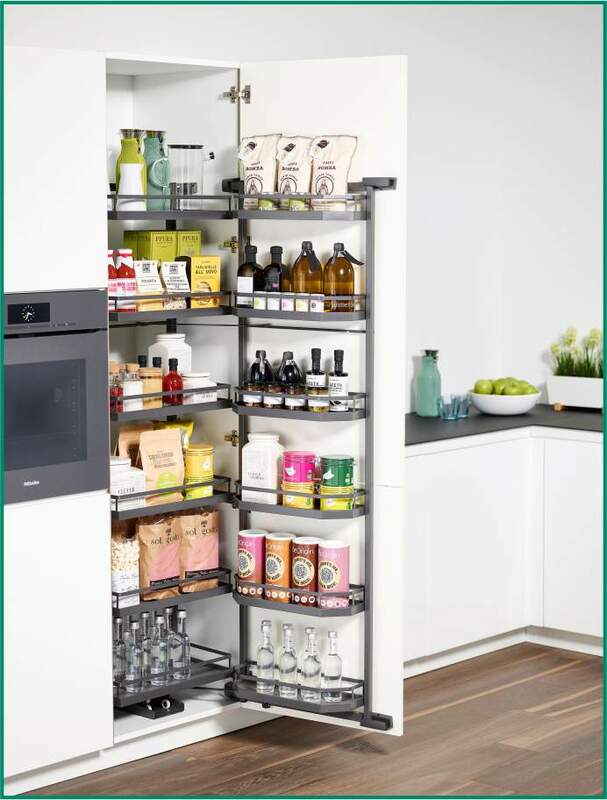 It allows usersto fill up the whole width and height of a tall cabinet. It creates space, order and clarity. Thanks to the railings, all the stored goods - even in the upper levels - are visible from either side. The new clickfixx technology means that installation is a breeze. All the parts fit together with a "click" firmer and stronger than ever. Touch Control, a revolutionary addition to the Dispensa package is an optional accessory - with a small knock the mechanical arm pushes the door open with ease eliminating the need for handles.